Reggae Music was born somewhere in the 1960’s, on the island of Jamaica. A historical event, because it marked the start of what was going to be one of the most spiritual forms of music the world has ever known. Thirty years earlier, Jamaica witnessed another historical event as the island gave birth to the Movement Of Rastafari. This movement has been a major influence throughout the history of Reggae and is responsible for the irremovable spiritual foundation of the music. Reggae and Rastafarian Culture developed into a worldwide phenomenon as it reached out to countless sufferers with a prophetic message of hope and identified the world system as the biblical Babylon. Reggae Music is often called “JAH Music”. JAH is a Biblical Name for the Creator. Christians sing this Name every time they say “HalleluJAH”, and the Name can be found in the King James Version in Psalm 68:4 as well. Most Reggae artists will have one or more musical works that will contain worship of the Creator. Where the Bible says “Every Tong Will Confess”, you could say that in Reggae Music we see a prophetic foreshadowing of this truth. Another prophetic foreshadowing becomes clear, when the Movement of Rastafari is observed from a spiritual perspective. Every Rasta worships JAH Rastafari, which means: JAH, the Head Creator. Ras Tafari was the name of the Ethiopian Emperor Haile Selassie before he became Emperor. This name Haile Selassie means “Power of the Trinity”, an obvious Reference to Jesus Christ. The Ethiopian Emperor did not claim to be Jah Rastafari, did not claim to be Haile Selassie, but used these names because he was aware of the fact that since he was a son of Solomon, his very function as Emperor was a prophetic foreshadowing of that one King, Jesus Christ. The spiritual roots and nature of Reggae music has appealed to countless of people worldwide throughout the decades, who where drawn to JAH, the Creator, without the mediation of a Church or any other form of prison by what is usually called “Christianity”. Where we have established, how the spiritual roots of Reggae Music was born thirty years before the music itself came into existence, we are now about to establish another fact, which took place about thirty years (!) after the event. A fact that has a very spiritual nature too, but not a very positive one. Or even better, let him explain! May I introduce you to “Pastor”, “President” MARK MOHR, self-proclaimed “pioneer and leader of the Gospel Reggae genre”, founder of the band “Christafari” and the philosophy of “Christafarianism”, first among many “Christafarians”? Christafari is the name, and don’t we dare think that this is jus a slick word play on the word Rastafari. Christafari venomously denies this, and points out to the word “Christophorus” which they claim means “Christ Bearers” to explain where they’re coming from. Research will reveal, that CHRISTOPHORUS is the official name of the one we know as Christopher Columbus, and it will not take a rocket scientist to realize that Christopher Columbus is not really, let’s say, appreciated by most people in the Caribbean. Deep research will reveal, that indeed Christafari isn’t named after Christopher Columbus just because of the obvious similarity with the word Rastafari. Deeper research will lead every Truthlover to the conclusion, that indeed Christafari has more in common with Christophorus Colonos than with Rastafari, even though the word indeed is a rather perverse and sickening imitation of the word that means Head Creator. However, we are talking about the kind of research that takes years and years. The kind of research you do after you engage something that doesn’t seem right. The kind of research you do, when you find out that people have made themselves an image that cannot be described as anything else but a perverse satanic imitation of what you know to be your Spiritual Identity in Jesus Christ. This research is done, this conclusion is drawn. It started in the mid 1990’s, when Frysian DUB Artist Messian Dread and the Californian Mark Mohr “met” each other over the Internet. Both men initially thought they had met a spiritual brother. Both wore dreadlocks, the mark of the Nazarite. Both produced Reggae Music. Both used the Ethiopian colors Red Gold and Green in their appearance. Both gave praises to JAH and both firmly proclaimed Jesus Christ. Both men were doing it as a matter of expressing their spiritual identity. Messian Dread knew himself to be part of Reggae and Rastafari Culture. In 1987, JAH (Jesus) told him to grow his dreadlocks as an outward sign of his spiritual identity. After this, JAH told a black born again Rastaman originally from French Guyana but living in Belgium to visit Messian Dread and teach him the basics about his spiritual identity. Both men had never met and the details about this meeting are simply remarkable. Mark Mohr knew himself to be part of the Christian CCM and Neo-evangelical Culture. After he “came to Christ” in 1987, “God” told him to imitate the outward appearance of what he perceived as Rastafari and Reggae, and start calling himself a “Christafarian”. He would study “cults” on the infamous BIOLA University and learned the finer details of his wolves-in-sheep’s-clothing-method at Bob Beeman’s Sanctuary Church, where he was also “ordained” as a “pastor”. Bob Beeman, by the way, is well known for founding the Christian Heavy Metal Industry in the 1980’s by mixing “church” and “ministry” with business. His “church” produced bands like Stryper and Vengeance Rising, for example. Bob Beeman would encourage people to dress up like Satanists, speak like Satanists, look like Satanists. The only difference would be the words. Where the Satanist Heavy Metal bands would speak about “Black Metal”, Bob Beeman would speak about “White Metal”. You could say, that Bob Beeman’s “Christianity” was some form of “anti-Satanism” like Satanism likes to present itself as a form of “anti-Christianity”. Mark Mohr learned to apply Bob Beeman’s approach of the Satanic Heavy Metal Culture to what he perceived as Rasta and Reggae Culture. He learned to dress up like a Rasta, speak like a Rasta, look like a Rasta. Just outwardly, that is. Just to make a name for himself, a carrier in the Christian Industrial Complex. This is how “Rastafari” became “Christafari”. This is how Mark Mohr and Messian Dread would “meet” and initially think that they were spiritual brothers. It went like this: Mark Mohr asked Messian Dread to help him out on a certain messageboard in the Internet. Mark Mohr was quoted in the Christian Media as saying –for example- how it was an honor among Rastafarians to kill Christians. When people who knew better would start to address this issue in the public messageboard, he simply asked Messian Dread to tell these people that it was not Mark Mohr who was saying that. Messian Dread in his turn asked Mark Mohr to rectify his public statements, or to use his contacts in the Christian Industry to spread truth rather than lies about Rastafari and Reggae. The rectifications never came, and when a third “incident” of this kind occurred Messian Dread woke up and smelled the coffee. These were not isolated incidents; these were symptoms of a pattern! Messian Dread started to contact Mark Mohr and tried to show him how he could not “apply the Bob Beeman method” to Rastafarians, so to speak. For you can say whatever you want about Bob Beeman and his method, you cannot compare Rastafarians and Satanic Heavy Metal fans spiritually. Messian Dread had been blessed to transcribe the interview with Gadman, the leader of the biggest Rastafarian Organization in the world, quoted in this article as saying that he does not believe the Ethiopian Emperor to be what his names mean. This transcription became authorized by Gadman and is now spread all over the world. Messian Dread sent Mark Mohr a copy of the audio as well as the transcription of the interview, and asked him to rectify the enormous amount of false information about Rastafari on the Christafari website. Mark Mohr would respond increasingly in an aggressive manner, as he climbed on the ladder of the Christian Industrial Complex, where he proclaimed “God” told him to “plug a gap”, for: there was no “Gospel Reggae”! Mark Mohr’s band “Christafari” had joined a Reggae tour with some well-known artists like Steel Pulse and Buju Banton. 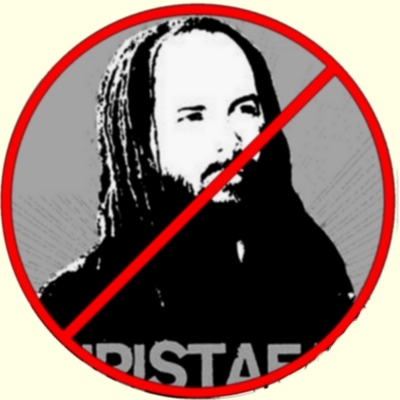 During this tour, they handed out booklets written by Mark Mohr in which he disdainfully insults Rastafarians and tells lies about the movement. One artist, Buju Banton, got so angry at Mohr’s writing that he wanted to cut the dreadlocks of Mohr’s head. He went on and “planted” a church in Trinidad, after failing to “plant” one in Jamaica. It was his attempt to start a “church” in the style of Bob Beeman’s Sanctuary Church: more a gateway to the Gospel Industry than a genuine Gathering on Jah People. It failed miserably, and Mohr privately wrote what sources described as a “divorce letter”. However, he never made this public himself. All of this gave him an opening to the Christian Industry bigtime, as he built his own little empire within the borders of CCM and has now (august 2007) sold over 400,000 CD’s in which he basically preaches a Purpose Driven Gospel and back-bites to people, such as people in Trinidad who he refers to as “cannibals” in his album “To the Foundation”. Back in 2004, Messian Dread had privately tried to make Mark Mohr dwell on truth rather than lies, about Rastafari for example, for seven years. This is when Messian Dread wrote a little booklet in December 2004 called “Christafarianism, or: Don’t Be A Rasta, Be Like A Rasta”. It wasn’t received well by Christafari, who had been writing negative articles about Messian Dread years before the publication of the booklet “Christafarianism”. They launched a campaign to kill the messenger, starting off by publicly handing Messian Dread over to Satan. All hell broke loose as the true nature of Christafari and the attached philosophy of Christafarianism was uncovered to a deeper level. A year later Messian Dread published a second book: “The Mystery of Christafarianism” in which he revealed the spiritual identity of the “Christafarian” and wrote a detailed, heavily footnoted unauthorized biography. Mark Mohr is still considered to be the leader of the growing Gospel Reggae Industry. The Emperor in his Gospelreggae Kingdom is still naked, as he makes his dollars and paves the way for clones of himself: Artists proclaiming in their music and video clips how Jesus is going to make them rich with this “new style”, for example. Messian Dread is still exposing Christafari, exposing the Christian Industrial Complex of which Christafari is only a little part. He has written numerous articles and has an extensive research archive on his website, where a special place is dedicated to the expose of Christafari. He is hated by the majority of “Gospel Reggae” artists, who themselves are working towards a carrier in the Christian Industry while they spread lies about Rastafari and Reggae Music in order to justify their commercialization of Christianity. Messian Dread’s struggle against the forces of the Christian Industrial Complex can be considered a school example of Spiritual Warfare in the 21st Century. JAH Willing, he will be interviewed on Channel-Z on August 25, 2007 about this very subject.